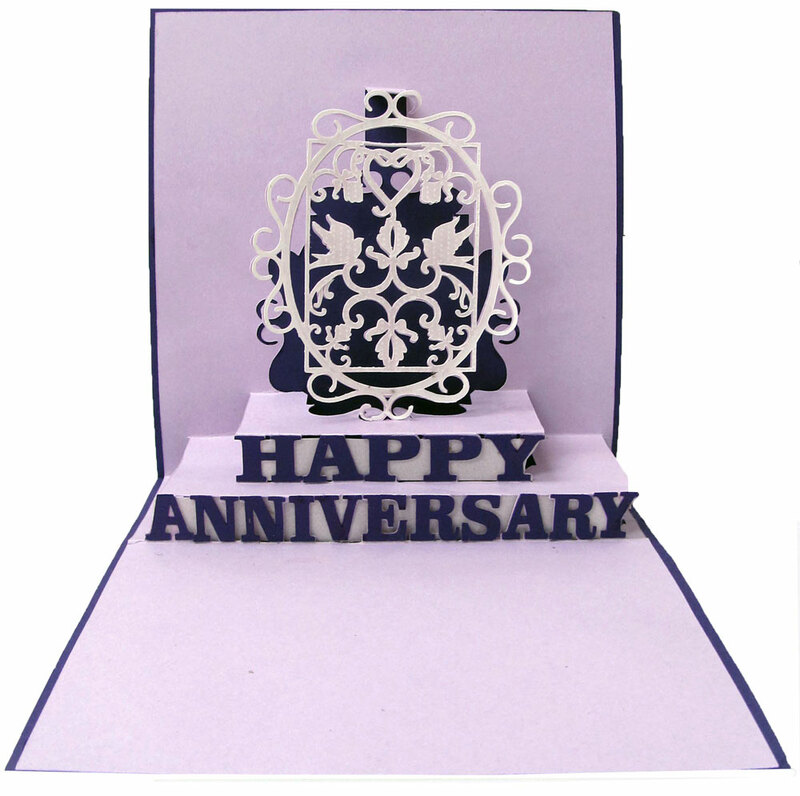 I needed a nice anniversary card, and found some suitable designs for creating it in the Pazzles Craft Room Image Library. I wanted to use my Piercing Tool for this project, and thought that this 3D Butterfly would be perfect inside of a frame for the card front. The piercing and embossing on vellum gave the pieces the elegant touch that I was looking for. 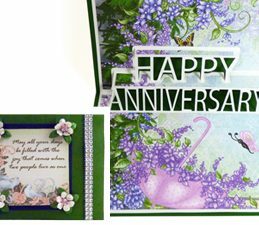 I used a Purple Viva Pearl Pen to create the tiny pearls on the center of the butterfly to add that final touch to the completed card. Simply Tagged – I ungrouped the original frame, and used the inside piece of the tag frame. To that I added a drawn oval measuring 3.8″w x 2.3″ h, and aligned to the center of the frame. This formed the frame base for the outside of the card. See the InVue Video Tutorial on Draw Ellipse (oval). Swirl – I duplicated and rotated this to place around the resized frame. See Klo’s Video Tutorial covering Scale, Rotate, Width/Height, Mirror, dated July 12, 2015. Klo covered the Multiply feature in her classroom on November 2, 2014. 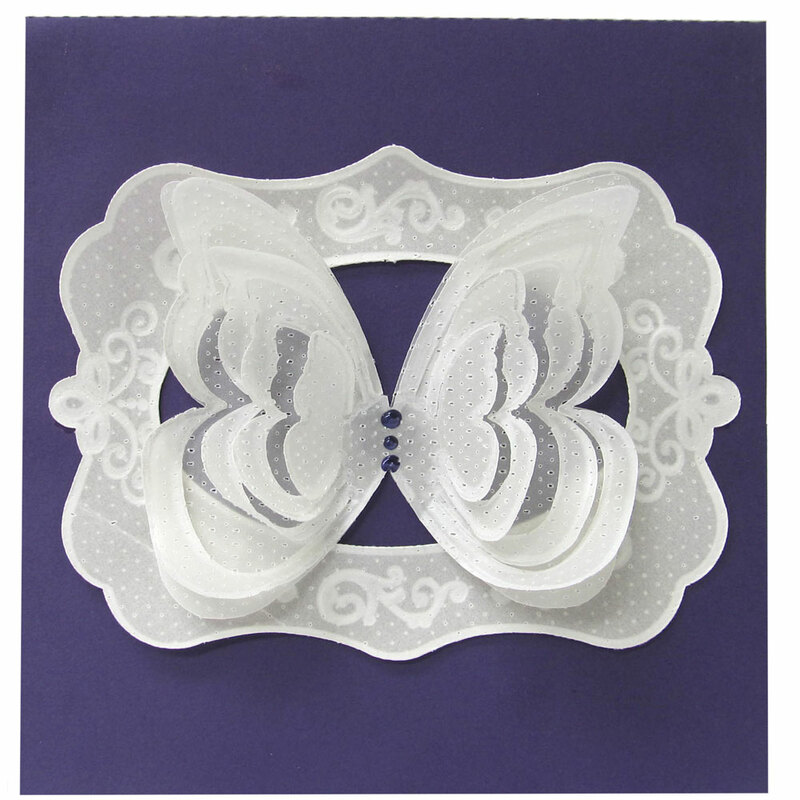 3D Butterfly – I duplicated this design, ungrouped the duplicate, and removed inner cutting lines to serve as a base for the popup shape to which the center of the popped up butterfly was attached. 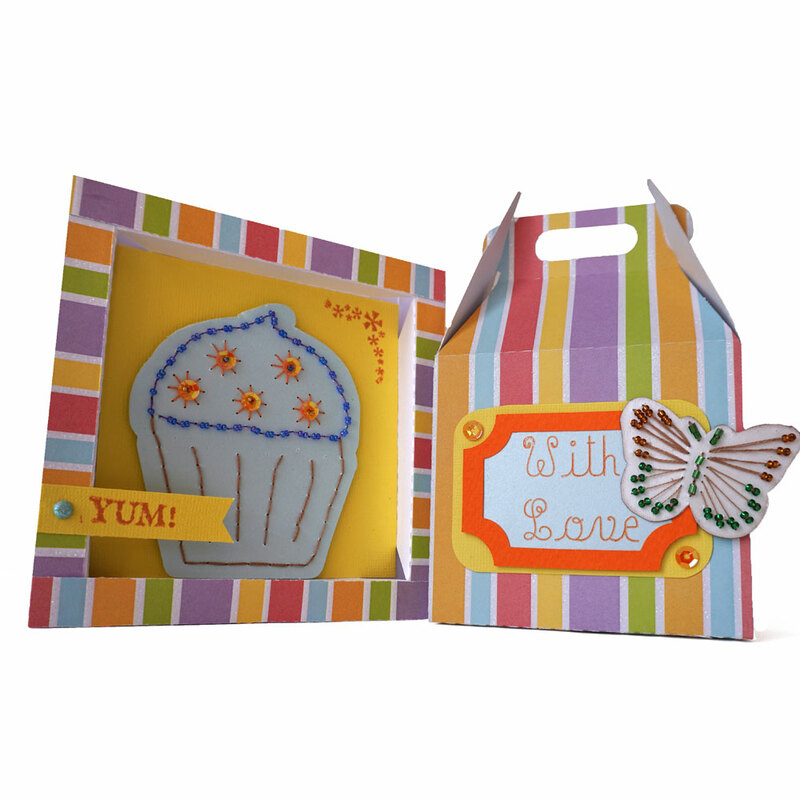 Vellum was used for the Frame, butterfly pieces, and overlay for the inside of the popup card. 24# vellum is most commonly found in crafting stores, but it is very fragile for the embossing process. A heavier vellum of 28# or 36# is a better choice, especially for the frame and popup overlay. The vellum portions of the designs were first filled with piercing marks using the InVue software Piercing feature. I used the following settings of the Piercing Options: Inline, Fill, .03 for spacing and line spacing, and offset even rows. See Klo’s Video covering how to use this feature. I used the Pazzles Piercing tool for piercing the vellum. I did the piercing, embossing, and cutting of all the vellum pieces using the Pazzles Embossing mat. I created the embossing lines in the InVue software by using three Inline shadows at .01″ on the cutting lines for each of the pieces to be cut from vellum. I used these Inline shadows for drawing with a Signo Uniball white pen, and for embossing, as demonstrated by Klo on the video covering embossing in Klo’s Classroom dated April 3, 2016. See also Klo’s Classroom Video tutorial covering Install the Pen Tool. When creating embossed lines on the heavier vellum, I used the larger of the two embossing tips of the Pazzles Embossing Tool to make several passes on these lines. Drawing and embossing on 24# vellum served to stretch and slightly curl the butterfly wings to give it fullness and a fluttering quality. When cutting the very intricate frame for the popup card, I used two passes with the blade. 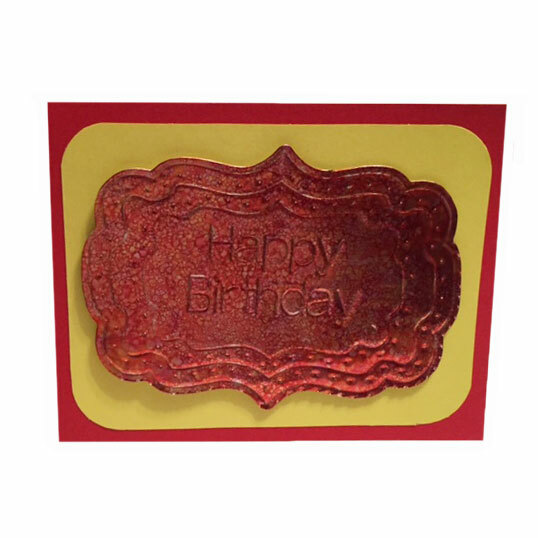 The popup card includes solid score lines for use with either the Pazzles Embossing tool or the Pazzles Engraving tool. I prefer using the engraving tool with popup cards on the regular mat for the score lines. The lines could be changed to dashes in the InVue software for cutting with the blade, but cutting dashed lines weakens the anchors of the small tabs in the popup design, making them more prone to tearing. I did cut dashed lines for the card backing. See the Kiss-Cut or Score? video tutorial in Klo’s Classroom dated June 29, 2014 and the Lines Styles video tutorial in Klo’s Classroom dated Aug 2, 2015. Now that you know the process for creating this, I’m giving you a shortcut. You’ll find the PVGC file for this card, formatted with all of the piercing and embossing lines added for you, included below. Julie, your anniversary card is amazing! I love the butterfly, it’s so gorgeous! It really fits well with last Sunday’s online class with Klo. Thanks for sharing the file with us. Beautiful Card Julie and what a great job you did on the write up. I always had problems with that part when I was on the team. I can see you are going to be a great asset to Pazzles and all of us who love our machine. 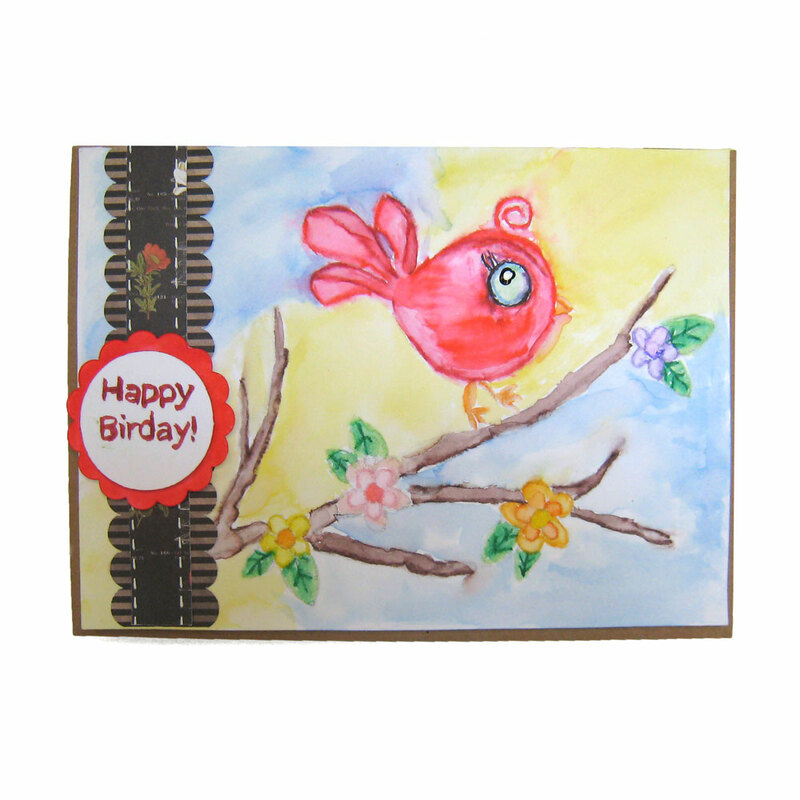 So beautiful card, using different tools and a lot of options from the Invue Software. Wonderful project. 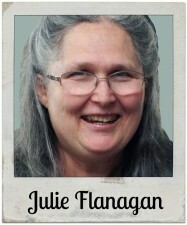 Great card Julie. I really liked how you explained what you did and gave us the file. This is one of the best ways to learn. Thank you.